Be sure you read this info before you arrive. No valid 2019 CAMPING-ticket means you can’t enter our camping site. Entry fee is 20 EURO for the weekend (1, 2 or 3 nights) per person and is NOT included in the festival ticket. Buy camping tickets in advance. Camping tickets are not sold separately! 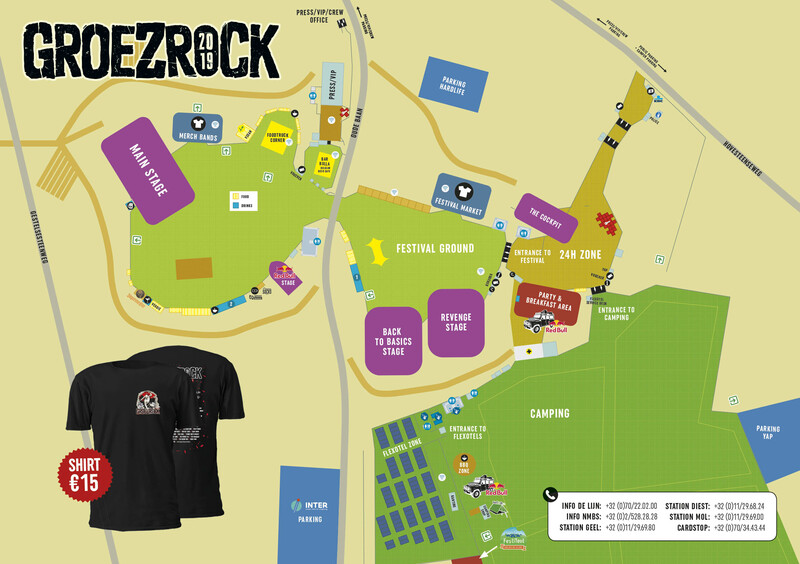 The campsite is located behind the festival ground and is big enough for all our visitors. The festival takes place in a natural environment. 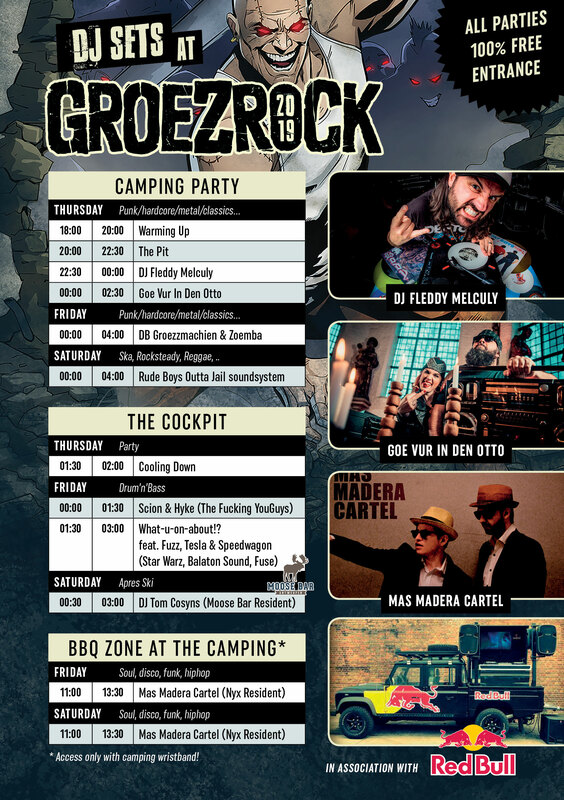 Do not damage the surrounding fields and properties as this will jeopardize the existence of Groezrock. Keep the place clean, use the rubbish facilities. The local attendants will keep their eyes open. Toilets, showers, fresh water, FIRST-AID post and facilities for wheelchair users. Use indicated entrances and exits. All tents must be set up in the marked spots. Fire lanes and emergency exits need to remain clear at all times. Tents placed on fire lanes or emergency exits will be removed. Remember: Fire is a constant danger, especially when campsites are crowded. A special place for cooking with your butane gas will be provided. Campfires, esbit fires, barbecues and gas burners with pierceable cartridges are strictly forbidden. Only small gas burners with a security valve cartridge are allowed. FORBIDDEN: gas cartridge Campingaz C 206 filled with 190 g butane / propane (usable until -10°). Suitable for supplies for 206 equipment. Pierceable cartridge without a security valve. ALLOWED: gas cartridge Campingaz CV 270, filled with 230 g butane / propane (usable until -10°). Suitable for supplies for 207 and 470 equipment. Cartridge equipped with a security valve. Breakfast with tea or coffee will be served on Friday & Saturday from 08.00 till 12.00. The camping bar will be open from early morning to late night. Small generator units are not allowed at the campsite. No grafitti. Control is very strict. If you get caught, you will have to pay for the damage immediately and head for home. Catapulting any kind of object into the air will result in a fine and immediate removal of the entire festival site. PACK AND GO! Trespassers will be reported to the police. No vehicles allowed on the camping area.Trolleys, camp gear bagage trolley, shopping carts, wheelbarrows, push cart, car, camper, moto, caravan or other means of transport are not allowed on the camping site, unless you can fold it and store it in your tent. If you still decide to bring one of these they will be confiscated at the entrance. These objects can be reclaimed after the festival. Park your car at the Parking Area. Park your vehicle at the Camper Area. No animals of any kind are allowed on the campsite. Stray dogs will be caught and owners will be fined 125 euros. Refusal to pay: dog will be taken to an animal shelter. Extra costs will have to be paid by the owners. Rules guarantee smooth organisation. Breaking the rules may result in removal from the entire festival ground. Permanent surveillance. Security has the final word. Ticket will not be refunded. Serious offenders will be reported to the police. Camping is at your own risk. We can not be held responsible for accidents and theft.